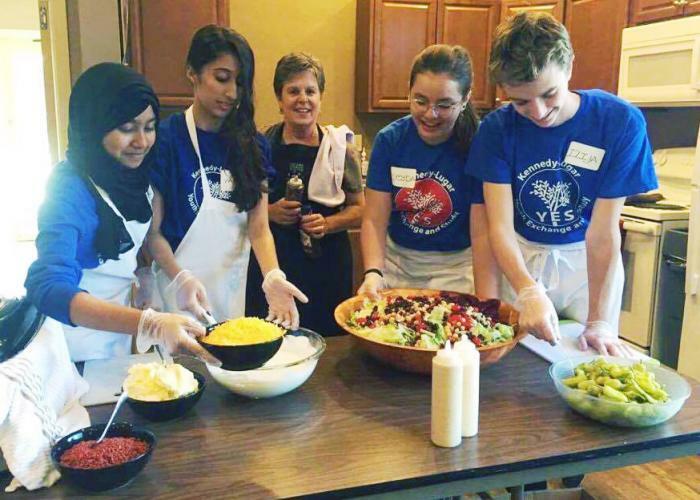 Ayusa’s annual Community Service Contest is a fantastic way for our exchange students to share how they are giving back to their host communities through volunteering. Each year we look forward to reading about the many hours they have devoted to charities and organizations in their host communities. Best of all is hearing in the students’ own words how these experiences have shaped their worldview and enhanced their exchange experience. We received many amazing entries this year, but the ones who stood out most were Emel Hyusein from Bulgaria, living in Texas, Ilija Ristovski from Macedonia, living in Idaho, and Rihab Soltani from Tunisia, living in Oregon. In her home country of Bulgaria, Emel didn’t have many volunteer opportunities. She made up for lost time after arriving in the U.S., contributing over 140 hours to her community so far. She has spent time at the food bank, the animal shelter, and a horse therapy ranch. The food bank made a huge impression on Emel, as she saw first-hand its impact on the homeless community in her city. Her first day of serving food to the homeless was particularly significant. “I scooped stew 495 times that day and there wasn’t a single person who didn’t say ‘Thank you’ or ‘God bless you’. I was overwhelmed with emotions. I felt so much joy and happiness from helping these people, but also sadness at the same time.” Emel also spent time volunteering on a horse therapy ranch for special needs children. “At first, I was a bit scared to work with the kids because I was afraid I would hurt them, that they are too fragile but in no time did I realize that they are not weaker than the regular kids, or less smart…they are just different in their own way. I loved working with them and learning more about the world from their perspective, the world from the eyes of a child that is different.” Emel treasures her volunteering experiences for the opportunities to meet amazing people, learn more deeply about American culture, and grow into a strong and independent woman who has already created positive change in the world. Ilija, from Macedonia, not only found a wide variety of volunteer opportunities, he also created some of his own. After serving food in a homeless shelter, he got the idea to organize a drive for kitchen supplies for shelters in need. He led the effort to organize and promote the drive at his school, and collected and delivered the supplies himself. Ilija also loves working with children and spent a lot of time at the local YMCA. One day, he noticed one girl teasing another girl for speaking Spanish instead of English. “I told her I was from another country and she seemed very surprised because she couldn't notice my accent. I explained to her how our differences don't matter, and how the girl that was talking Spanish might know how to talk English but maybe she was embarrassed that she wouldn’t do a good job. The girl that bullied felt very regretful about her actions after talking to me and went and apologized to the other girl, who by now was in the corner thinking she had done something awful. After she apologized, they played together and got along like nothing had happened.” Ilija’s experiences have given him new ideas for how he can give back to his community back home, and he says he has begun to consider pursuing a career in social work. Rihab, from Tunisia found plenty of volunteer opportunities in her Oregon host community, including tutoring her fellow classmates, working with children at an art center, and volunteering with Habitat for Humanity. However, her favorite volunteer experience has been working with refugees. She worked closely with a Syrian family who had recently arrived to the U.S., and especially loved bonding with their 5 year old son, Jan. “When I first met him, he didn’t know any word in English, he only spoke Farsi, but we managed to play together and communicate. His first word was ‘cookie’!” As an exchange student, Rihab had a unique understanding of what it's like to adjust to living in a new place and culture. “Being part of this has shown me and everyone else how to conquer all our religious and cultural beliefs and find a way to communicate, how to consider our differences as a positive factor that allows us to learn from each other instead of rejecting each other. It showed me how to feel people’s suffering and how to serve without expecting something in return. How to be human!” Rihab is looking forward to continuing to volunteer after her exchange year, particularly helping seniors and people with disabilities. Thank you to all who participated in this year’s Community Service Contest!